We are fond of mentioning the hilarity of nostalgia here at TTS. Often our youthful objects of desire are considerably less needful to our middle-aged selves. Back in the day, one hundred of Honda's carbureted horses somehow felt better than ninety-six of Volkswagen's fuel-injected motivators. Today, neither feels very good. The truth is, it's all relative, and if you dispassionately view the hardware of yore, it can look primitive and largely uninspiring. I don't think this is the case here. 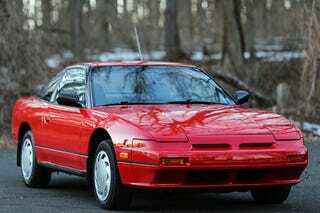 Before the Subaru BRZ/Scion FR-S twins, there was the S13 Nissan 240SX, produced from 1989-1994. Alleged to be the spiritual successor to the original Datsun 240Z, the S13 had all the right hardware specs: a tidy rear wheel drive chassis featuring MacPherson strut front and multilink independent rear suspensions, a cozy 2+2 configuration, four-wheel disc brakes, and a tight row-your-own 5-speed. It even had that totem of 1980s attainable sports coupedom, the pop-up headlight. What about the Toyota Celica? What about the Acura Integra? Hell, what about the Ford Probe? All good cars with pop-up headlights, but all front wheel drive. This was the only rear-driver of the group. The only letdown – and not unlike the complaints today against the Subaru and Scion – was the power output. The KA24E 12-valve single cam 2.4-liter inline-four pumped out 140 horsepower, which wasn't fantastic even back then. It was big for a four-banger, and a little unrefined, lacking the Acura's smoothness. More on this in a minute. The S13 was built during a pretty great time at Nissan. The Maxima really was a four-door sports car ("4DSC"), especially in 5-speed SE trim. The Z32 300ZX had just launched. Even the Sentra was a fun little econobox, and the SE-R hotrod – a BMW 2002tii for the time – was only a couple of years out. This base model 1990 240SX from a dealer in Pennsylvania is shocking for several reasons. The first is condition. Minus some light wear, it looks almost exactly as it did when new. There seems to be no rust and, at the most, minimal bodywork. It's hard to tell, but the paint/reflection on the driver's door may not match the rest of the car. Could just be the photos, though. Further, the black accents around the back of the car don't continue on the rear bumper. The seats are gorgeous, including all the plastic trim. It wears cheapy "sport" tires, but I'd think you could source a proper set of Toyos – what the car originally came with – just for nostalgia's sake. There are a few minor items that seem to need attention – the window winders, the exhaust tips – but the overall condition is remarkable. The second reason is the fact it appears completely unmolested, down to the stock wheel covers and stereo. I've seen very few in this state, and none in this 5-speed hatchback configuration. So many have been "upgraded" with Japanese domestic market (JDM) nose conversions, all manner of Nissan four- and six-cylinder turbo conversions, $200/pair eBay seats, fart-can exhaust pipes, and suspension systems made for show rather than any form of go. My cousin had a 240SX he purchased new in 1989. It was identical to this one, except I don't remember his having mudflaps. We occasionally commuted together in it from Norwalk, Connecticut to Yonkers, NY. The Parkways around southwestern Connecticut and the greater New York City area – four lanes divided of twisting asphalt snaking through the woods and designed for 40 MPH but regularly travelled at 70-plus – emphasized just how great this perfectly balanced chassis was. Indeed, over any kind of road, the car just went where you pointed it, either with the steering wheel or the throttle. My 16-year-old self got to know the car quite well. It was one of the few rear-drivers I had access to, and I learned a lot about car control in it. I also learned what happens when you hit 112 MPH on the Merritt Parkway – speed-limiter fuel cutout, leading to personal heart failure – and that you needed to push in the clutch to start the engine. So back to that "lack of power" thing: Driving this car on those roads, even viewed through rose-tinted 20/20 hindsight, it didn't feel underpowered. Just like a Miata or an E30 3 series BMW, there was always enough "go" to get you there while having a ton of fun. Look at the interior. It has everything you need and nothing you don't. It is a driver's cabin, with simple controls, supportive seats, and a low cowl. The shifter falls perfectly to hand. The headlights pop up via a huge dashboard button! I think even today I would enjoy driving an early S13 240SX. It has all the right hard parts, and has them in the right places. It has everything I need in a car, minus ABS (available later in the less attractive, facelifted SE model). $10,000? Probably high and hopefully negotiable, but sure, why not? Go find another one. No, really. Let me know if there are any others out there. The buyer of this time capsule should be obligated to sign a document promising to never alter its lovely face, notarized and witnessed by Yutaka Katayama himself. The penalty for failure to comply would be swift and ugly, the perpetrator made to drive around in a white Nissan Altima coupe with a CVT for all eternity. That's how rare this car is.